The five members of AS I LAY DYING have released a half-hour video in which they discuss the return of their classic lineup — Tim Lambesis on lead vocals, Jordan Mancino on drums, Phil Sgrosso on rhythm guitar and backing vocals, Nick Hipa on lead guitar and backing vocals, and Josh Gilbert on bass and clean vocals. 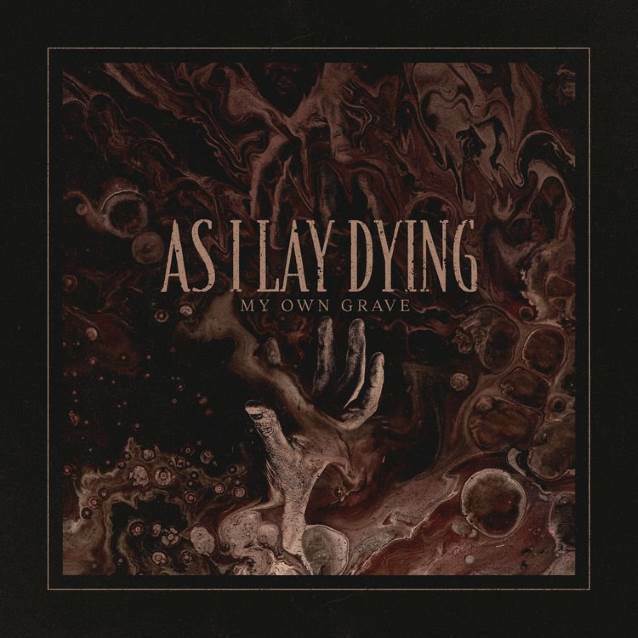 Earlier in the month, AS I LAY DYING released a new song called "My Own Grave" and announced its first comeback show, which took place Saturday night (June 16) at Soma Sidestage in San Diego, California. Prior to the arrival of the new song, AS I LAY DYING hadn't released any new music since it issued its sixth album, "Awakened", back in September 2012. Last December, Lambesis released a statement in which he apologized to his former wife and children for his "appalling actions." He also accepted responsibility for being "the sole offender and the only one to blame for everything that happened." The return of AS I LAY DYING has raised some questions, particularly since Hipa categorically denounced the band's disgraced frontman as a "sociopathic narcissist in definite need of rehabilitation" in a social-media post back in 2014. In the just-released video, Lambesis spoke about the steps that he took to reconnect with his bandmates after his release from prison, explaining that he "first reached out to Jordan and Josh" because "that seemed the most natural place" for him. "And I reached out to them in an e-mail a long time ago, and the first individual conversations we had were mainly me listening so that I could better express my apology." He added: "There's the obvious wrongdoings that I made and then there's the little ways that they sort of spread out beyond that and hurt people in so many ways that I really wasn't entirely aware of until I got home. And those conversations kicked off, and I was able to sort of better understand what they'd been through and I think more sincerely apologize because of that." Lambesis was arrested in May 2013 after handing a "hitman" — really an undercover police officer — $1,000 in cash, along with his wife's address and gate security codes. Prior to the murder plot, his wife had asked a San Diego Superior Court to dissolve their marriage. Lambesis admitted that he went into survival mode after his arrest, explaining that he hired people to defend him and speak on his behalf. As a result, he said, he "definitely bought into that and that influenced the person" he was while he awaited his sentencing. "Then my sentencing happened, and that moment in the courtroom [when I expressed my remorse] was true and genuine, but I didn't have any ability to follow up with it in any way… And then there was such an unbelievable sense of relief after my sentencing of, like, defense is no longer in my vocabulary. I don't defend what I did, because there's no defense for it. I'm not gonna try to defend what I did, because it's ridiculous. All I can do is make amends where possible, express my remorse and just put my energy into something positive." Hipa acknowledged in the video that he had repeatedly rejected Lambesis's attempts to sit down and talk. "When we met up, it wasn't very positive at first. I said [to Lambesis]: 'Look, I've seen you say you're sorry, you've said it how many times, but when has it ever been real? '… And it was nothing but genuine remorse on his end and taking responsibility for everything that he's done. I was watching, [and with] every question I had for him, I was staring straight into his soul, looking for any hint of inauthenticity. [It was] like I knew this was a trick. And when I didn't see it, when I finally let my guard down, [the person] who was standing in front of me was someone genuinely contrite and remorseful [that he] could never take back what he did [and] the fact he made victims of all the people close to him. "When I saw who he was, and who he had genuinely become, I let go of that. I wanted to let go of it, because I had never handled it and that pain and that hope and that helplessness, I let it become my life for worse in the form of hatred. I used that as my strength for all those years, but it devastated me on the inside." 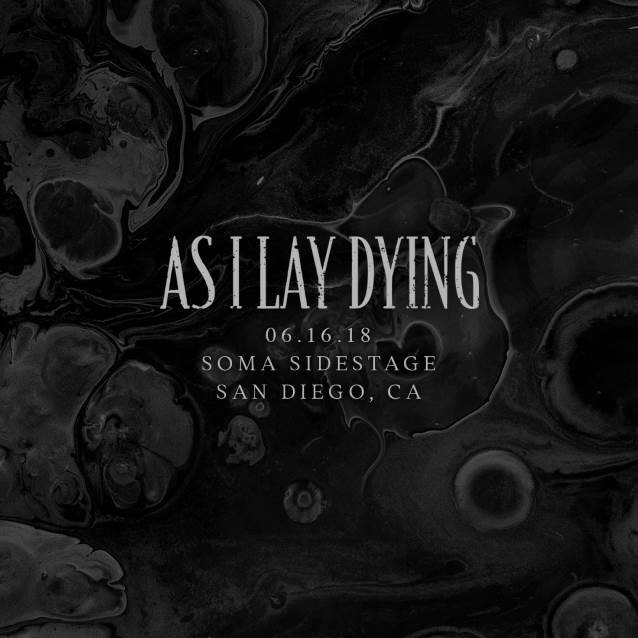 The $10 tickets to AS I LAY DYING's first show since 2013 at the 300-capacity Soma Sidestage reportedly sold out in four minutes. It was said to be the band's decision to play on a smaller stage rather than the 2,000-capacity mainstage.